Crown. Very Good- in Very Good- dust jacket. 1999. First ed; First Printing. Hardcover. 0609602330 . 9.10 X 6 X 1.20 inches; 336 pages; Signed by Author . Isaac's Storm. a Man, a Time, and the Deadliest Hurricane in History. Crown Publishers, N. Y.. As New in As New dust jacket. 1999. First Edition. 0609602330 . 1st Edition. Book and dustjacket are in As New condition. Book is a hardcover. A story of the hurricane that hit Galvestson and the lives it affected. Published by Crown Publishers. 323 pages. ; Standard Book Size . New York: Crown Publishers. Fine in Fine dust jacket. 1999. First Edition; Fifth Printing. Hardcover. 0609602330 . An eye-catching first edition/later printing in Fine condition in alike dust-jacket; Story of Isaac Cline, meterorolgist, a time, and the deadliest hurricane in history, the storm that hit Galveston in the early 20th century. Research is based on Isaac Cline's own letters, telegrams and reports, testimony of survivors and our newe . Redlands, CA: Roland C. Hartman. Good in Good dust jacket;. 1956. Fourth Edition. Hardcover. 8vo - 8" to 9" tall; 304 pages; Mylar Cover on dustjacket, Dust Jacket Rubbed with Chips & Tears, Book Tight, Illustrated Black White Photos, Text is clean no markings seen, . Crown. Very Good- in Good+ dust jacket. 1999. Seventh Printing. Hardback. 0609602330 . 9.10 X 6 X 1.20 inches; 336 pages . New York: Crown Publishers. First Edition. Hardcover. 0609602330 . 323pp; Very good copy in very good dustjacket; 235 x 155mm . New York: Crown Publishers. Near Fine in Near Fine dust jacket. 1999. 1st. Hardcover. 0609602330 . Book and dustjacket are in excellent condition. "Meticulously researched and vividly written, [this work] is based on Cline's own letters, telegrams, and reports, the testimony of scores of surviviors, and our latest understanding of the how's and whys of great storms." Should be relevant today for anyone concerned with climate change. ; B&W Illustrations & Maps; Small 4to 9" - 11" tall; 323 pages . Recorded Book, 2000. 7 AUDIO CASSETTES published by Recorded Books, always unabridged, withdrawn from the library collection. We will test each of the cassettes, before shipping, for quality of sound to make sure that you receive a worthwhile set. Enjoy this reliable Audio Cassette performance.. Audio Cassette. Good. Audio Book. Vintage. Near Fine with no dust jacket. 1999. Paperback. 0375708278 . Trade Paperback. This is a tightly bound copy with a bright, clean interior and in Near Fine condition. Read once. " This is a bestselling narrative of the extreme hurricane that struck Galveston, Texas, in 1900, leaving at least 8,000 dead in its wake. 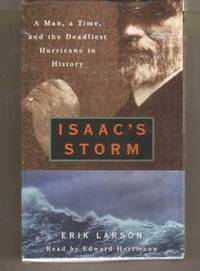 An unforgettable story of the conflict between human hubris and the last great uncontrollable force, "Isaac's Storm" offers a cautionary tale for the millennium. " ; Maps; 0.8 x 7.9 x 5.1 Inches; 323 pages . Vintage. Good with no dust jacket. 2000. Paperback. 9780375708275 . 7.90 X 5.20 X 1 inches; 323 pages . Vintage. Good with no dust jacket. 2000. Paperback. 9780375708275 . 8.10 X 5.20 X 0.90 inches; 323 pages . Vintage. Very Good-. 2000. Trade paperback. 9780375708275 . Staining on page ends. A few creased pages. ; 0.7 x 8 x 5.2 Inches; 336 pages . Random House Audio. As New. 1999. Audio Cassette. Partially sealed audio book with 3 cassettes and 5.25 hours. Abridged. Remainder mark over UPC code. .